INTERVIEW: NOAH (Avanchick) x Karpis (Lightning Strikes) | VKH Press – J-Rock & Visual Kei Coverage Worldwide! It was recently announced that Avanchick’s vocalist NOAH was chosen to take part in a collaboration album spearheaded by Karpis Maksudian and featuring veterans in the metal scene like Nando Fernandes (Hangar), Rob Math (Seal, Toni Braxton, Leatherwolf), Cat Tate (Snew, Red Again), and special guests Derek Sherinian (Dream Theater, Kiss, Alice Cooper, Billy Idol, Yngwie Malmsteen) and Tony Martin (ex-Black Sabbath). As we previously mentioned, NOAH will be recording guest vocals for two songs on the album. “Doki no Sakura”, which is a traditional song, and will be recorded in koto by Masayo Ishigure, and “Kamikaze,” which was originally written in 1986. 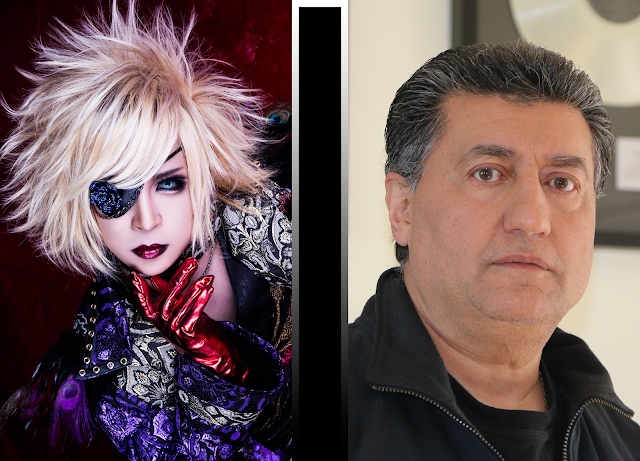 VKH Press was given a great opportunity to sit with NOAH (Avanchick) and Karpis (Lightning Strikes) for an interview. It was a chance not only for us to get more information on the project, but also a chance for NOAH and Karpis to learn more about each other’s motivations for it. VKH: So many people are surprised by the announcement of your collaboration! How did you two meet? Karpis: We actually haven’t physically met as yet. We’ve only talked a couple times before on Skype. I contacted Hiroshi, who put me in contact with Marinovich PR, and then we contacted NOAH. VKH: Karpis, what made you choose NOAH for the album? Karpis: For this album I really wanted to do something different. I could have gone with a vocalist from a regular Japanese heavy metal band but I wanted something more unique. So I tried looking at visual kei and I saw some of NOAH’s videos with Avanchick on Youtube. He had such a wide range, he could do enka style, screamo, hard, anything. So I really wanted him for this project. VKH: NOAH, how did you react when you were contacted about the recording? NOAH: I honestly thought it was a spam email (laughs). When I read the e-mail it really didn’t seem possible that these artists would actually want me for an album. I really, really thought it was a joke. I mean why not ask a vocalist in a more popular band like LUNA SEA or X JAPAN or L’arc~en~Ciel. At first, I couldn’t decide whether to reply or not. When I finally decided to reply to it, though, I was glad I did. VKH: NOAH, have you ever sung enka in the past? NOAH: No, I haven’t. Originally, my dad was an opera singer and my mother was a classical pianist. Enka wasn’t something that I was really around growing up. At the beginning, and I hate to say this, but I didn’t really know about the song “Doki no Sakura (同期の桜)”. Listening to the track at first, I realized that “Oh this is enka” so I thought it was going to be an overseas release of an enka cd or something like that. Then it suddenly changed into a really hard sound and I was really surprised (laugh). For the second song, after I listened to the recording I realized that the vocals would have to be able to switch between enka and a hard rock style, so it made more sense. Karpis: I was just wondering what it was like for NOAH’s parents when he told them he was going to sing enka. NOAH: I haven’t told them yet, but I will buy the CD for them when it’s released. VKH: What was it like for you two working together? Karpis: It was very easy, I’ve gotta say. He was very humble and professional. We had only one or two Skype meetings. We went over a few things and he agreed to change the sample - it was good enough to start recording professionally. It was very easy to work with him, and I felt like he was very professional. Karpis: When we gave NOAH the instrumental files, everything was ready except for the vocal tracks, so we sent him the files and the lyrics. The good part is, the song (“Doki no Sakura”) fits so perfectly as an intro to “Kamikaze”, I think. “Kamikaze” is about the warriors and bravery of the Japanese people, so “Doki no Sakura” was a very good intro. VKH: What was your goal behind making this album (with so many different genres and artists featured)? Karpis: The main goal is, as I said [before], to produce something completely different. So many bands have been coming out with heavy metal albums recently, and there’s nothing new. Tony Martin (ex-Black Sabbath) is my good friend, so I asked him to do guest vocals. Then I found another singer, Nando Fernandes from Brazil. Actually, he currently lives in Brazil, he’s not American. All of my singers are international. It’s not something I really thought about, but that’s how it happened. For some of the songs, we redid them in a more modern style with more heavy leads. I also asked Tony to write both of the lyrics and put his stamp on it. I was lucky enough to have this great lineup. I talked to Derek Sherinian [too], and I told him I was doing a project and asked if he wanted to give it a shot as a guest keyboardist. He wanted to listen to it first, and after he listened to a couple of the mp3’s he was in. He played the keyboard for all 10 of the songs. Cat Tate, [whom] I’ve known since ‘85 or ‘86 [and] Rob Math, [with whom] I did a couple videos with Leatherwolf. I met Rob Math through his band. I basically asked them all and they all agreed to do it. NOAH was actually the last artist to be added. VKH: So it’s very personal, but also quite global at the same time. Karpis: Well it will be released in Japan, USA, and Europe. At the same time though, we haven’t decided on a target audience yet. We haven’t done any press releases on heavy metal sites or in heavy metal circles. That’s gonna come in the next few weeks, I should say. VKH: NOAH, do you have any personal goals or expectations from this album? NOAH: As for goals, I think being able to cross over national borders is the most important for me. Avanchick isn’t really known overseas. Even so, Avanchick’s CD Eternal ended up being surprisingly well received in Europe and a lot of orders came from there. With this project, I thought “oh maybe we can try to make it overseas”. But still, out of all the bands in this project, it’s still a mystery why I was chosen (laugh). Karpis: Well we’re very happy to have him, and I really hope it helps out his career. I’m interested in knowing what his band members thought. NOAH: Originally, the other members were all wondering if I had gotten a spam mail as well. Because the special guest list seemed too good to be true. The other members were with me when I did the recording for the songs so it started to feel a bit more real, but it’s still unbelievable. I think we’ll have to listen to the final CD because it’s quite surreal. We’re still half in disbelief. Karpis: Avanchick is a great band though and NOAH is a really talented and gifted guy. We like his lyrics as well. VKH: Karpis, what made you decide to cover traditional Japanese songs? Karpis: Well the reason I did [Doki no Sakura] was because it fit perfectly with Kamikaze. Actually, when I started I was going to only use koto, but when I saw NOAH’s videos on Youtube I realized that he could do enka style. “Doki no Sakura” isn’t originally an enka song, it’s a marching song for war. Since I asked the koto player (Ishigure) to play a very soft, mellow version of the song I realized that NOAH could sing over that with enka style vocals. If it didn’t work then maybe we would not have used it, but it came out perfectly. We just kept building on what we had. We started with one idea and kept adding more and more. I kept changing the project but it’s finalized now. VKH: Has it been fun to create your very own versions [of them]? Karpis: Yes because it doesn’t sound anything like the original. The way we did it with NOAH and Masayo Ishigure playing koto was in a completely different style. To me, it’s more beautiful than the original. It’s nice and mellow. I love enka songs and I listen to them sometimes. So it’s kind of an inspiration for me. VKH: So Karpis, what made you interested in Japanese music? Karpis: In general I’m not interested in Japanese music, but at the same time I didn’t want to use a singer from a Japanese hard rock or heavy metal band. That’s why I went down a different path. I wanted something new and it came out really good. Generally, I don’t really listen to that many Japanese songs. I listen to too many other things. I listen to Greek, Russian and heavy metal most of the time. VKH: NOAH, are there any overseas artists that you listen to? NOAH: Not really. If I were to name an overseas band that I like, nothing really comes to mind. VKH: No one at all? NOAH: Maybe Mariah Carey? Interestingly enough, our drummer [Hyu-ga] listens to quite a lot of foreign artists, but for me I mostly listen to Japanese bands like GLAY, LUNA SEA and L’arc~en~Ciel. These are the kinds of bands I grew up around. Starting from now, though, I feel that this project has given me a feel of what overseas rock bands are like in terms of composition style and things like that and I have the chance to learn from this experience. VKH: What was your first experience as a musician like and when or how did you decide to pursue music? Karpis: Well I’ve been playing music since I was a little kid. I started with the school brass band back in Russia. When I came here and started a band back in the 80’s, I played here and there, nothing major, but a couple places. Then we gave up because there were too many bands at the time. You had to be really popular or really different to get signed. So we gave up but then 26 years later I decided to come back as a producer and put together some projects. But I’ve always played music basically. I always listened to artists like Deep Purple and Black Sabbath. I’ve always loved that kind of music, but I never had the chance to do an entire project so this is my chance. All my energy and money is going into this so hopefully it will take off well. NOAH: Originally I was extremely sports oriented. Since both my parents were musicians, from the time I was little it was always a battle between pursuing music or pursuing sports. I ended up doing both of them to some extent and in the midst of deciding which one I should pursue for real, in the end I got older and older and ended up following my parents. By the time I realized, I was committed to being in a band. Karpis: He chose the right path, though. I think so. VKH: What are your hobbies besides making music? Karpis: I play with a lot of radio controlled airplanes and cars, that kind of thing. I love cars. Lately I don’t have much time for it since I’m in the studio. It’s not like I’m sitting home all day playing with airplanes (laughs). I wish. NOAH: Hmm, not really. Basically, I spend all my time with music. Lately, I like eating nabe. Kimchi flavor. VKH: If you hadn’t become musicians, what would you probably be now? NOAH: I’d say high school teacher. My older brother is currently a high school teacher. Karpis: I don’t really consider myself a musician because I don’t do it full-time, but I’m directing lots of videos. I’m a video director basically, so it’s not that bad. I work a lot with musicians and that kind of thing but I can’t really call myself a musician. It’s kind of a hobby. In America not too many people make money through music, so I have to work. My first choice growing up was to be pilot. VKH: Are there are future plans you would like to share? Karpis: I want to say that the album will be released in mid-May hopefully. If we get signed with a record label then most likely we’ll do another CD. NOAH: In terms of Avanchick, we’ll probably announce any upcoming plans at our one-man at Takadanobaba AREA on February 5th. Avanchick has only been active for a year and a half and we do about 13 lives a month, but we’re still very new. so from now in terms of our future plans, we would eventually like to do things like an overseas tour, but it all depends on the timing. I think this project will be the first step for us, though. VKH: Thank you so much for your time! Would you please send a message to your fans and our readers? Karpis: I just want thank everyone, MarinovichPR, special thank you to NOAH and the rest of Avanchick for being so supportive. I want to thank all of the people who are going to listen to the album. Whether you like it or hate it, it doesn’t matter. Not everyone is gonna like it, let’s be honest. I really appreciate all the help that I’ve gotten from this so thank you to everyone. NOAH: Like I mentioned before, this project has been quite surprising both for me and the rest of Avanchick. We’ve only been around for a year and a half but with our February 5th oneman and this project it feels like we’re slowly taking steps forward. So I want to see how far Avanchick can go and I hope we can test our limits as a band, with this project and as Avanchick’s NOAH. And when the CD is released, I do hope people go out and buy it. Thank you. Many thanks to Karpis Maksudian, NOAH, and Marinovich PR for making this possible!